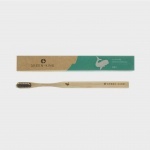 Green + Kind Toothbrush with Black Nylon Bristles in Soft, with a Seahorse Design. 50c from every toothbrush sold is donated to Sea Shepherd Australia. 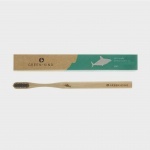 This biodegradable bamboo toothbrush is made with black nylon bristles and comes complete with a bamboo round handle with a seahorse design. If you love the ocean, especially seahorses, you’ll simply love this toothbrush and you’ll be able to tell it apart from all the other toothbrushes in the bathroom. We dispose over 30 million plastic toothbrushes every year in Australia alone straight into landfill choking our planet and ending up in our rivers and oceans harming marine life. Turtles are greatly impacted by plastic in the ocean as it looks like their food so we all need to take action. These toothbrushes are biodegradable and can be put in the composter. Note that the bristles are nylon and are not biodegradable. Brush with your bamboo toothbrush twice a day. Change your toothbrush every 6 to 8 weeks. Compost when finished.